King's Gambit Bishop Gambit - Chess Gambits- Harking back to the 19th century! White takes aim at f7 and prevents Black from getting in ...g7-g5 effectively (as can happen if White plays 3.Nf3) since White can play h2-h4 and then ...g5-g4 will not hit a knight on f3, so playing ...g5 just weakens Black's kingside pawns. Therefore, most of Black's main defences involve hitting out at the bishop on c4 by playing ...d7-d5, often with the aim of returning the pawn and equalising by achieving easy development. Objectively it is probably no better or worse than 3.Nf3, but I think that 3...Nc6 is a very challenging response which forces White to play accurately in order to keep a fair share of the chances. White has left the king open to checks at h4, so 3...Qh4+ is a logical reply. Black can probably equalise with best play after this, although White gets good compensation for the misplaced king due to a strong centre and potential to chase the black queen around, and in practice White tends to do well. After 4.Kf1 I think Black's best is to strike out in the centre immediately with 4...d5 5.Bxd5, and then my examinations suggest that 5...g5 might be the best try for Black, hoping to cause enough disruption on the kingside to offset White's strong centre. Objectively the chances are roughly equal, but I would rather take White. One advantage of the King's Bishop Gambit is that White does not allow the Modern Defence (3.Nf3 d5 4.exd5 Nf6) since White can play 4.Bxd5 here. Then 4...Qh4+ transposes to 3...Qh4+ lines, but the most usual response is 4...Nf6. If Black takes the bishop-pair by taking White's bishop on d5 then White generally gets a strong knight on d5 and good piece play, so Black tends to be reticent about taking the bishop. 5.Nc3 Bb4 6.Nf3 0-0 7.0-0 is the typical continuation. 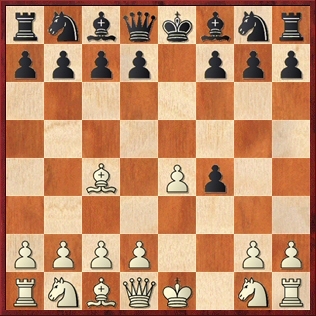 Objectively Black may be able to equalise here, but I find White's position to be more attractive than the positions that typically arise from the Modern Defence. This is traditionally the main line, but White shouldn't have too many problems generating interesting and equal play against it. Black aims to hit out in the centre with ...d7-d5, without allowing Bc4xd5. Heikki Westerinen has experimented with 5.d4!? with the idea 5...Bb4 6.e5 Ne4 and now 7.Qh5, 7.Qf3 and 7.Kf1 all lead to roughly equal chances and complications. Instead, the main line is 5.Bb3, getting the bishop out of the way of any ...d7-d5 tricks. Note though that Black can meet 5.d4 with 5...d5, whereupon 6.exd5 cxd5 7.Bb3 transposes into the line 5.Bb3 d5 6.exd5 cxd5 7.d4. Normal is 5.Bb3 d5 6.exd5 cxd5 7.d4, whereupon Black chooses between 7...Bb4 (aggressive, though leading to fairly attractive positions for White) and 7...Bd6 (defending f4, probably most reliable, good enough to keep the chances level). Black is generally unable to hold the extra pawn on f4 but gets easy development. I have always liked this line for Black, and in his book on the King's Gambit, John Shaw claims that it refutes 3.Bc4. I wouldn't go that far, but I certainly agree that it is the biggest problem with 3.Bc4. White does best to offer a second pawn sacrifice with 4.d4 Nf6 5.Nc3 Bb4 6.Nge2, offering the pawn on e4, which Black should avoid grabbing. Following 6...f3 (otherwise White regains the pawn at f4 and gets a good game) 7.gxf3, White has a rather draughty kingside but can, with accurate play, get enough compensation in the form of piece play, and has the half-open g-file. That said, I feel that Black's position is probably the easier to play. Of course the main point of 3...Nc6 is that if White responds with the "natural" 4.Nf3 then Black plays 4...g5 and gets into a Hanstein Gambit (covered at this site here), a variation which is playable for White at club level and more dangerous than its reputation, but is probably slightly favourable to Black with best play.